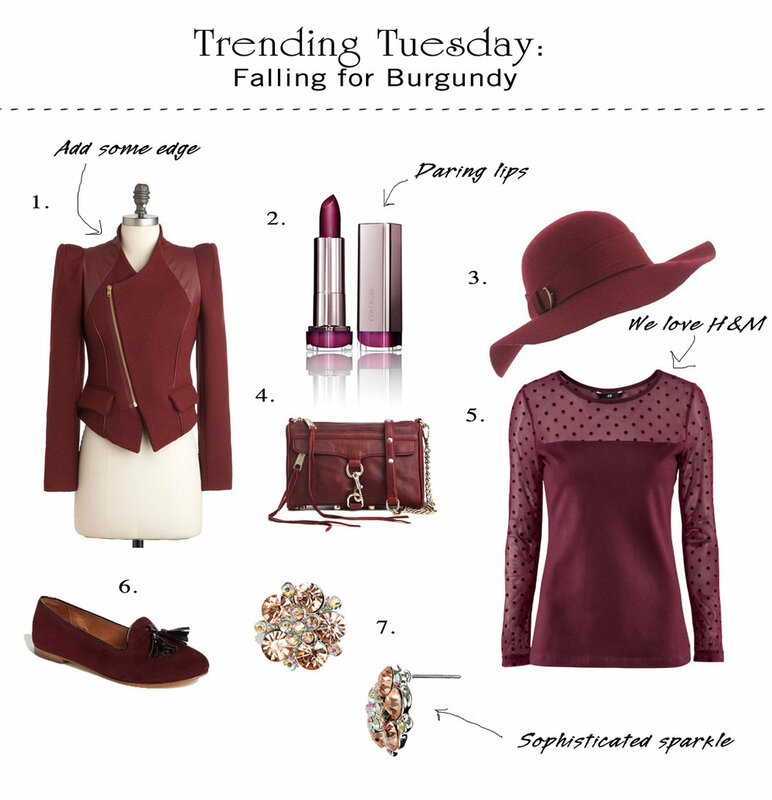 The color burgundy has donned models and mannequins from the runway to the nearest department stores this season. This warm hue will sure carry from the autumn to winter months ahead so stock up on a few stylish essentials. Here are some trending items that incorporate this beloved color into your wardrobe, whether you want a small accent or a bold statement piece. 1. Modcloth Wine Dining Jacket. Paired with a black riding boot, this structured jacket is the perfect way to look stylish on a cool Autumn day. The small details like the gold zipper and leather patches integrate current trends that make this jacket undeniably fashionable. 2. Covergirl LipPerfection in Euphoria. Just as the weather begins to have a slight chill in the air, the makeup tends to crave the cooler tones as well. Burgundy and plum lipsticks are the go-to item for the season. Create a polished pout with this affordable drugstore buy from Covergirl. 3. Forever 21 Buckled Floppy Hat. The summer months can no longer claim popularity for the floppy hat. With a touch of suede or wool, this new take on the floppy hat is an easy way to block the UV rays that can still cause harm during the fall. 4. Mini M.A.C. Rebecca Minkoff bags are all the rage and for the fall collection, she chose this burgundy tone for the famous Mini M.A.C. Just enough room for your phone, lipgloss and card case, the Mini M.A.C. is the perfect sized cross body for a fall day at the orchard or corn maze. 5. H&M Top. What makes this H&M top so great is that it is not only affordable but it can either be dressed up or dressed down. Paired with a dark pair of skinny jeans or a high waisted skirt and tights, this is a comfortable tee that will make either look fabulously stylish. 6. Steve Madden 'Chaufer' Flat. Loafers are one of the biggest trending items this fall. Traditionally worn with structured items, this piece is now permitted to have a little fun. It can be worn with denim or a flouncy dress. 7. Kool Connections Rhinestone Cluster Studs. Who doesn't love a good dose of sparkle? Worn with any burgundy item, these studs compliment the hue and offer a girly touch.